And now here comes yet CD collection of Jackie-branded songs to help us relive those distant days. 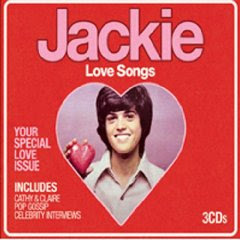 This 3 CD set is called ‘Jackie - Love Songs’ and it is what one might call an ‘eclectic’ collection, which is another way of saying there really is no discernable connection between these songs and, what’s more, they have nothing whatsoever to do with Jackie Magazine. Well, apart from the fact that most of the artists no doubt appeared in pictures in the pages of Jackie. Oh, by the way, welcome to the new blog. The 80s Empire Blog has now moved to this new site on Blogger. The old blog is still online (for now, anyway) but from now all the new Blog-type stuff will appear here so, 80s fans, be sure to update your bookmarks!